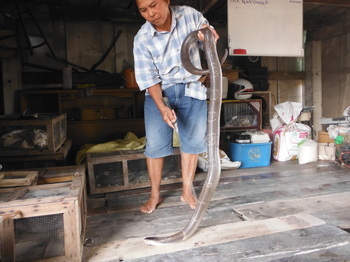 As is well known, all over Thailand you can find many types of snake. Some are extremely large, such as the python, others extremely poisonous, like Cobra and King Cobra, which can be an unlucky bite, not just for people, but elephants too. Traditional Thais have an adventurous appetite, we eat snake,insect,worm and even scorpion. The woman in this picture is the local snake hunter family in small village. Who tracker all kinds of snake from the the rice field. These are sold to the restaurants in the town.